Graphs, networks and trees are commonly used to model application domains. In some cases these structures are highly dynamic and can not be defined at design time. Yet there are also cases when they are rather static and do not change during the application life cycle. An example of such static structure is a finite state automaton – defined as a part of design, it remains unchanged at the run-time. However, programming languages do not provide facilities that would make creation of graphs (trees) an easy task. Most common approach is to use XML with a custom schema and encode a graph (a tree) with XML tags. Unfortunately, development tools does not provide the same degree of support for editing an XML file as they do for many wide spread programming languages – detecting typos as you type, reference navigation with one mouse click, etc. Additionally, using an XML requires a utility to process the XML and build a model corresponding to the definition. 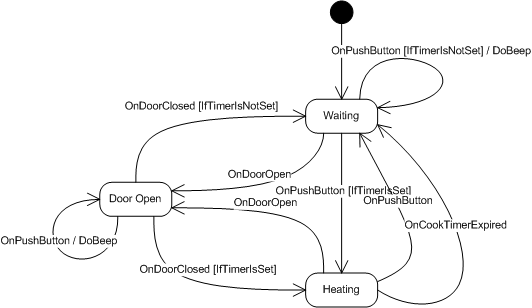 Another approach to define a graph – instantiating objects and establishing references among them “by hands”. The code created with this approach is burdened with poor readability and maintainability. An ideal solution would be using a domain specific language for these purposes, however cost of creating such a language is tremendous at present time. 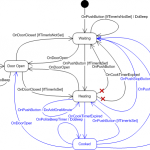 This article suggests an approach on adapting the Java programming language for defining static graphs, trees. 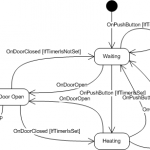 If we look at Java classes, interfaces and references among them at the high level of abstraction, their appear to be a linked graph where classes/interfaces can be thought as nodes and references – as links between them. These thoughts, being turned inside out, lead to the following rationales: a graph can be represented as a set of interfaces where an interface represents a node and a reference to another interface represents a link. Such references, for instance, could be return types of methods defined in the interface. The following table lists rationales on graph representation. Lets consider a simple microwave with one push-button and a knob timer. This microwave starts heating when the user pushes the button and the door is closed and the timer is set. Pushing button again stops heating, opening the door suspends heating until the door is closed again. A state chart for this microwave is shown on Figure 1. The following code snippet shows how this state chart can be represented with the rationales given above. * In Heating state it actually heats. Obviously, this is only definition and it requires, as well as an XML definition, some code to turn it into a run-time artifact. Java Reflection API provides all necessary means for examining the definition but producing a valuable output is an application specific task. In other words, the task is split on two concerns – (1) examining the definition and (2) generating the output. The source code sample attached to this article provides a utility class that implements first concern (Walker) and an application class (MicrowaveSample) that generates microwave automaton assembler code for a PICmicro MCU (see sample output below). 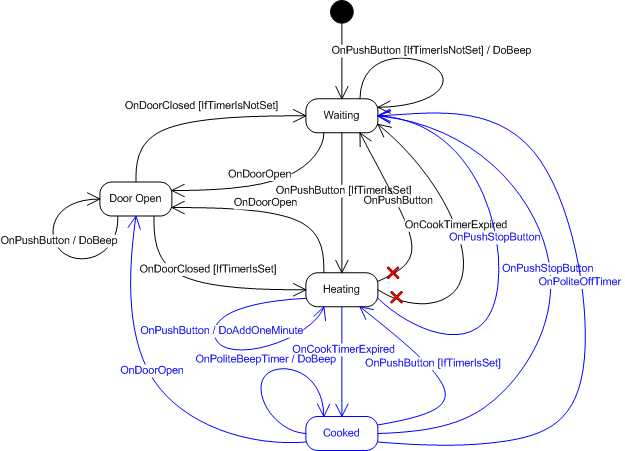 Walker class exposes one method processAutomaton accepting a state chart definition class and communicates with MicrowaveSample via WalkerCallback interface implemented by MicrowaveSample. Now, lets image that we have this microwave automaton in full production, and R&D department came up with a innovative and conceptual design of a microwave with two buttons 🙂 and sales department insisted on adding a ‘polite reminder’ feature. State chart for the new microwave automaton is given on Figure 2 where blue color indicates new state and transitions and red cross denotes transition no longer needed. A big part of the state chart remains the same as in previous version one and, thus, can be reused in a new state chart. With the approach that this article suggests, a state chart can be extended by means of Java inheritance, e.g. new state chart extends the previous. With very little efforts the new automaton is defined as given below. Although, this article is focused on finite state automatons, similar approach can be applied for defining other kind of graphs and trees. The author has a proof of concept for using nested classes as a representation of a web-application URI structure and mapping HTTP requests issued by very complex but strictly structured HTML forms. This was written by Eugene. Posted on Wednesday, December 9, 2009, at 06:13. Filed under Java. Bookmark the permalink. Follow comments here with the RSS feed. Both comments and trackbacks are currently closed.